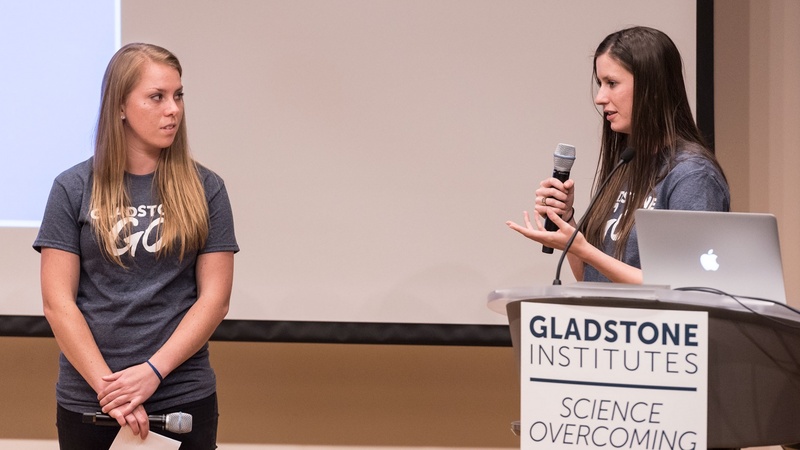 Oriane Matthys and Jessie Butts, graduate students at the Gladstone Institutes, introduced the new graduate student organization to the Gladstone community at the kickoff event. Graduate students are a critical part of the scientific enterprise at the Gladstone Institutes—and vital to its mission. Yet, until recently, they lacked a forum to exchange ideas and provide support to each other. Gladstone GO is changing that. The new graduate student organization (GO) aims to foster a supportive and collaborative scientific community that will give students a holistic training experience and prepare them for their future careers through mentorship, team-building, and career-building opportunities. Gladstone GO emerged after a meeting between graduate students and Gladstone President R. Sanders “Sandy” Williams, MD. At the meeting, they openly discussed the needs of the students and how a graduate student organization would help to fulfill those needs. At the kickoff event in early September, graduate students gathered to discuss the group’s goals and opportunities. While Gladstone does not grant degrees, graduate students—mostly from the University of California campuses at San Francisco and Berkeley—conduct research at Gladstone as an integral part of their training program. Subcommittees of Gladstone GO will address specific topics surrounding the needs of the students. For example, the social committee will encourage social and professional development by providing opportunities for graduate students to learn about careers and network with other professionals. These opportunities will include hosting a graduate student appreciation week, workshops and panel discussions, and social events. The retreat committee will focus on organizing retreats for graduate students incorporating invited lectures, student talks and poster presentations, and community-building activities. Additional committees will focus on bringing graduate students from across the institutes together and advocating for graduate students participating in Gladstone’s outreach activities. Gladstone GO committee chairs include Jessie Carr, Frances Cho, Alexandra Clemente, Yvanka De Soysa, Stephanie Holden, Emily Jones, Ariel Kauss, Kathleen Keough, Ashley Libby, Sarah McMahon, Stephanie Moquin, Ramsey Najm, and Faten Sayed.